Home » Collection » Lita Hornick in her dining room, dessert for our lunch, Richard Boseman’s “The Norseman” on her north wall, we thought to visit Franz Klein exhibit at Whitney Museum a few blocks from her Park Avenue apartment. Writer, critic, excellent art & poetry patron. February 2, 1995. 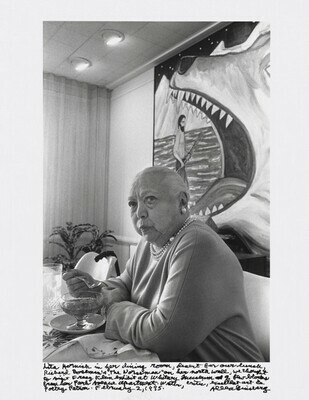 Lita Hornick in her dining room, dessert for our lunch, Richard Boseman’s “The Norseman” on her north wall, we thought to visit Franz Klein exhibit at Whitney Museum a few blocks from her Park Avenue apartment. Writer, critic, excellent art & poetry patron. February 2, 1995. Beat Memories: The Photographs of Allen Ginsberg, National Gallery of Art, Washington; National Gallery of Art, Washington; Grey Art Gallery & Study Center, New York University, New York; The Contemporary Jewish Museum, San Francisco, 2010 - 2013, no. 85.